I don't think this was very good. At least the Green Lantern had some funny moments and didn't take itself seriously, this one leaves an odd feeling. As with other hyped movies the public fell all over themselves to see this like the herd animals they are. When you expect to be entertained to a level of quality that isn't fulfilled you feel cheated out of your money and the experience. “The ratings on this site are pretty accurate. Same goes for theater goers. I recently attended and more than half the seats were empty. I would say closer to 85% actually. About an hour in, you're asking yourself, if you should add to that percentage.” Because you post all day long. I think this was an amazing movie. The music and the clothes. The courage of a man. I don’t believe any of the negative reviews. They all look the same with a touch of emptiness. Like a taco wiithout the salsa. Like a zombie with not brains. I watched this movie today and it’s was a beautiful movie. No matter how much an user keeps posting fake reviews he can’t damaged or remove the movie from movie theaters or stores. Wakanda is the first word uttered in the Lion King. Wishing I were there than watching this. Meh, go or not go, there is no try. The ratings on this site are pretty accurate. Same goes for theater goers. I recently attended and more than half the seats were empty. I would say closer to 85% actually. About an hour in, you're asking yourself, if you should add to that percentage. My kids wanted to leave during the show. The usual droopy eyes looking up at me, telling me, we're bored. Usually after the popcorn runs out. If you can't keep 10 years olds entertained with superheroes, you're not doing it right. This movie would of bombed at the box office if it were released during the summer or Christmas. There is not enough here to call it a good movie. Rather shallow story line that tends to go on way too long. Actors are stilted and reciting lines from rote moreso than acting. The screenplay is listless and is two and half hours long. Waiting for Godot had more intrigue and better dialogue. I wouldn't recommend this movie to anyone over 8, and at that there are qualifiers. Loved this movie... the plot, the representation, worthy of 5 stars. I was rather disappointed in this movie. I can't really say why though. I liked the cast very much though the acting might have been a little better. I wish they could do a "do over". I don't regret seeing it. I will like to see the delete scenes from this movie and more of Wakanda. The DVD is going to be soooooo amazing!!!!!! This movie on IMAX format looked amazing. No too much on 3D. Still we loved the two times we watched this movie. This movie take you into a magic journey to unknown civilization your never knew. This was the fun part from this movie. Once more Marvel comes back with new fresh ideas. Black Panther was fantastic. The best part of this movie was the fighting scenes. The soundtrack of this movie was well done. This movie was like eye cand to my eyes. The cultural rich desmostration from the tribes. The dresses from all the cultures. The story was beautiful. This movie had all the elements of a great movie. A noble man who’s heart is on his people but at the same time with the rest of the world. I had a good time watching this movie. Well done film. Some good action scenes. The plot was very interesting. Loved the warriors ladies. hands down the best movie I have ever seen. 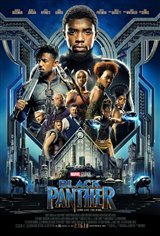 I am blown away by how amazing the scenery was, the phenomenal way black culture was displayed and the outstanding acting and action packed all into a 2 hour film. Honestly was left speechless and wanting more then the movie ended and I cannot wait for a second one. This officially lifts Justice League out of the superhero dog house, and gains status as the worst Marvel Movie to date. Wesley Snipes would of been a better choice. Coogler does not have the directing skills needed. The budget was enormous, so naturally the CGI is pretty good, but the casting was ill chosen and the direction was not apparent. It would of been better if they shortened it down to one hour and 45 minutes. There are times when it feels like it's gone on forever and then there are scenes that do nothing for the story. Not the worst movie I've ever seen, but I cannot recall another contender at this moment. Chad Bosewick is dry and rather stiff on the big screen. His stunt double, does well, but the face of the character does not have the range needed to fulfill the role. He's at best, a good support character for the Avengers, but not strong enough for a solo role. 45% rating? Tells you what you need to know. It's almost as bad as Wrinkle in Time, Mother and Ishstar. Ignore the five star spambot. He's paid to put the one line reviews in and enjoys fooling people into parting with their hard earned money. This is the weakest of all the Marvel Movies, bar none. Wait for it on Netflix, then you can turn it off and not cost you an evening and 50 bucks to watch it. No problem scoring seats in the theater with this one. There were moments where you sensed the movie would finally pick up and take you into the superhero universe, but then it would fizzle and it went back to talking and predictability again. More humor would of helped. This movie has as much in common with my life experiences as watching a movie from Bollywood. It may be a good movie for some, but for me it was like foreign movie that made little sense and plodded on way too long. There appears to be an imbecile posting five star reviews that is antagonizing the rest of the reviewers. This should not be allowed. The movie was shallow and long. Not much to go on here. A fantasy with lots of talking and little action. Not really inspiring or entertaining. Kind of a space filler for an evening. There are better movies to choose from, go for it.